WOW!!! I’ve never watched this speech in its entirety until just now – and wow… what a powerful message! Here is the full “I Have A Dream” speech that Martin Luther King, Jr. gave from the steps of the Lincoln Memorial on August 28, 1963. 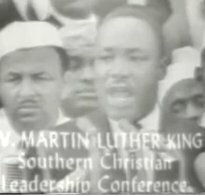 Below is the full video and text of this famous speech that is now such an important part of our American history.